Dress up your dinner table with these holiday reversible placemats featuring colorful Easter eggs on one side and the same colorful zig zag stripes on the other. This set includes 2 reversible placemats measuring about 12" x 16". 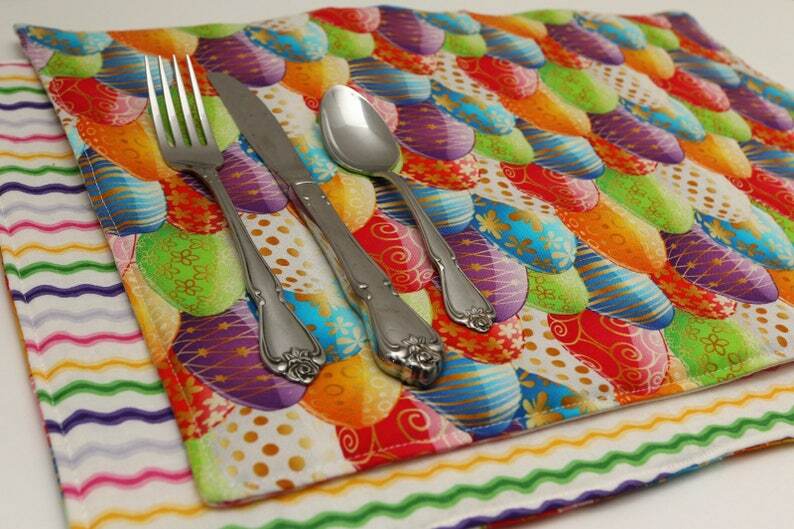 The placemats are made from cotton fabric and small loft needle punched batting . Machine Wash in Cold. Lay flat to dry or Dry Delicate. Iron if necessary. Looking for more or want less? Order more quantities when you add to cart or send us a convo to make a special order. If this is for a gift, send us a convo or include a comment during check out and we'll gift wrap it for you for free! Well made doll gown. I will be fixing my doll to look more like Marie Antoinette. Gorgeous St Patrick Historic Royal gown for a Princess of Iseult truly beautiful. We accept PayPal payments. Please convo us if you require an exception and we can discuss options. Items will not be shipped until payment has been received. To cancel a purchase, notify us within 2 days, prior to shipment and you will receive a full refund. If you wish to cancel a purchase after it has been shipped, please see our refund policy. If you aren't happy with your purchase, we can refund or exchange the item within 30 days of delivery. Send us a convo with the details of your problem and your preference for a refund, exchange, or damage correction. If you request a refund, you will be responsible for shipping the item back to us. Once the item is received, we'll issue you a refund for the original price of the item. If you request an exchange, you will be responsible for shipping the item back to us. Once the item is received, we will ship the item you selected to exchange it. You can exchange an item for any other item in our store or a custom item at equal or lesser value. If your item was damaged, send us a convo describing the problem. There will not be a charge for wear-and-tear damage correction. Extreme damages beyond wear-and-tear (kids with scissors or dog chews) may not be fixable or may require a charge for cost of replacement materials. If we think we can fix the problem, ship the item back to us. We'll fix the product and ship it back to you. If it was damaged upon delivery or within the first 30 days of delivery we will cover the cost of all shipping. If it was damaged after 30 days of delivery, you will be responsible for all shipping. We ship within 2 days of your purchase. If there is any reason for a delay we will notify you within 2 days of your purchase. We ship using USPS Parcel Post or Priority. If you would like a different shipping method or would like to expedite your shipment, please send us a convo prior to your purchase or add a comment during check out. International shoppers, please note that you are responsible for any and all duties and customs charges that may be incurred. Gift wrapping is available at an additional charge. Convo us prior to your purchase for details. Some of our items are tagged with Jenn Bass or Creative Tradition. If you prefer an item to be tagged or untagged, please convo us or add a comment during checkout. We know what its like to be proud of a handmade gift. If you want to claim credit for our handmade treasure, add a comment during checkout. We'll detag the item and provide you some information about the product's construction so you can wow friends and family with your creative knowledge.